The partnership we have with Ravenworth and Spots ‘N Spouts create a diverse sale offering with quality like no other!! This sale group provides the most decorated cattle both in and out of the show ring. 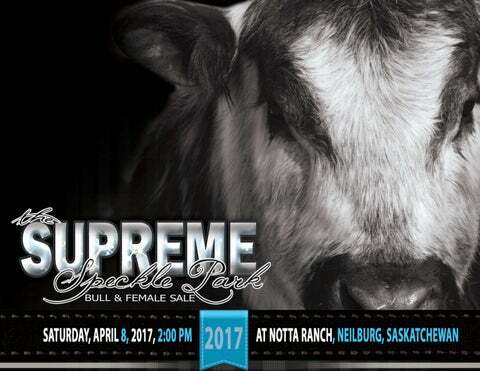 Along with Spots ‘N Sprouts, Ravenworth and ourselves at Notta Ranch, we welcome you to the 2017 Supreme Speckle Park Sale. We need to again thank all the past bidders and buyers for the support over the years. Notta Ranch couldn’t have asked for a better season!! The high selling bull from last year’s sale was twice crowned Grand Champion Bull. He won first at Lloydminster Stockade Round Up and again at Edmonton Farm Fair International. Congratulations INC Cattle Company and thank you for letting us be a part of it! What a great breed to be involved in! My trip to Canberra, Australia was short but gave me an opportunity to meet new breeders. I also had the chance to get caught up with the breeders who had approached us over a decade ago and created the genetic base for the country. My hats off, not just to them, but to all the breeders around the world for their hard work in progressing and promoting the Speckle Park breed so well. This is rapidly becoming a breed of choice for progressive cattlemen. Watching this transformation of the breed is astounding. Suppling the seed stock demand for all of this and still trying to support the rapidly increasing demand of the commercial market is a welcoming challenge for us all.The cattle on offer in this sale will assist all breeders in whichever direction they choose to go. As breeders,it is our goal, to produce higher quality cattle every year. This sale is proof of that. Truly the best set of cattle this group has EVER offered. SALE PARTNERS: We never dreamed when we got involved in Speckle Park in 1980 that this is where the breed would have ever taken us, here at Notta Ranch with our best ever line up of sale animals. Since there are getting to be so many bull sales to choose bulls from we feel it is very important that only the best of the best make it to the sale ring. That is why we have culled heavily and brought only the best two year olds produced by our 100 cow herd. They all have really good rates of gain which we trust they will pass on to their offspring. The heifers too are some of our very best and haven’t been easy to part with but they are the ones Chris Poley chose when we gave him the go ahead to pick 8 heifers from our herd for the sale. So to all our fellow consignors and buyers, let’s hope this sale goes down in history as another great day in the history of Speckle Park. South off HWY 16 on HWY 21 about 12 miles and 1 mile west on Lilydale road. You will see our sign at the corner of TWP RD 460 OR 8 miles north on HWY 21 from HWY 40 intersection. We have had an amazing 2016 with our cattle from calving right through to a very successful show season and meeting many more wonderful cattle people. With the highlight of year being Ravenworth Invictus 103C winning Reserve Champion Bull at Stockade Round Up and at Agribition, along with Ravenworth Legendary 101D winning the Speckle Park Breed Class in the Presidents Classic Bull Jackpot at Agribtion making that our second year in a row to have a Ravenworth bull calf win this title. We are very excited and pleased with all of the interest and support we have received for our genetics. The 2017 Supreme Sale brings with it our largest offering of yearling bulls to date, which we feel is very strong. We look forward to visiting with everyone on sale day. In the mean time if you have any questions about our consignments please contact us. Once again we are please to be working with our sale partners to bring this great offering together and we, as always, send out a special thank you to Sara and Jason for hosting this event. – Ravenworth Cattle Speckle Park. From the desk at T Bar... Supreme and more.... much more! Those who attended the Canadian National Speckle Park Show and Sale would have enjoyed the strength and power of the breed. The show was the largest , most powerful to date and the sale was the talk of the barns with jam packed seating at the show and the sale, which indicated the interest of new breeders... especially those from other breeds and commercial producers! What more can be said about Jason and Sara Goodfellow and their great breeding program at Notta Ranch! Let’s look at the National Show results... they swept all the heifer calf classes capturing Calf and Reserve Calf Champion, won both classes with their yearling heifers which were declared Junior and Reserve Junior Champion Females, then won both Grand and Reserve Grand National Champion Females with the yearling and calf. Adding to the blankets, Notta Ranch won Breeders Herd, Get of Sire and the coveted Premier Breeder and Premier Exhibitor awards. These Speckle Park pioneers showed the livestock industry why they are Supreme breeders. But... not to overshadow their sale partners and fellow breeders Garry and Donna Berting at Ravenworth... as they were on Nottas heels all day! This great family operation was runner-up in Breeders Herd, Get of Sire, captured National Champion Pair of Bulls, breeders of the Reserve Senior Champion Female and bred and exhibited Junior and Reserve Grand National Champion Bull. Let’s not forget about John and Dale Herbert from Spots ‘N Sprouts.... they maintain one, if not, the largest Speckle Park cow herds in the world. The breed gets a true test as John runs the herd ranch style in the same manner to that of their customers. Each year the feature is Spots ‘N Sprouts two year old bulls... bulls that can cover more cows, more ground and get the job done! As we research the genetics, one can find John and Dale’s breeding throughout the industry as they are the “ranching pioneers” of the breed. Whether you are an established breeder, a commercial producer, just starting or thinking about starting, mark April 8th at “Notta” to perhaps get the Supreme Speckle Park of the breed! It’s one of the few breeds of beef cattle that are never to late to get into... enjoy the great cattle and their benefits. Do not hesitate to visit any of the ranches prior for a preview and see the mothers; feel free to call any of these great breeders as they will be pleased to assist with selections and information. This is an outstanding sale lineup from all aspects. The genetics are right, the product is right and you are dealing with the right people! If we may be of assistance prior to or sale day feel free to call any of the T Bar Team or myself, we are willing to assist you in a professional, confidential manner. Join us sale day for a Speckle Park beef lunch at 12 noon. This is rarely seen. We took a great Lacerta female and flushed her to Royal Flesh. We sold a bull out of that flush last year to a producer that had progeny that were second to none. We then took an April born heifer from the same flush to Agribition and Grand Champion Female and she was also Grand Champion Speckle Park in the First Lady Classic. We are now selling the rest of the siblings. Proven performance that is hands down unmatched anywhere. This is one of those females that you know is going to go on and do great things for the breed! She possesses the same phenotype of her full sister Cadence. It scares us to think that we might have to show against this female in the future. Consigned By: Notta Ranch & kager Ent. This genetic combination has made us proud!! This cow never misses! Da Ja Vu 319D has the neck extension and “herd bull look” that I know will add some extra punch to your calf crop. The conformation and balance are spot on! Leptin Tested: CC Consigned By: Notta Ranch & kager Ent. A real female maker!! Going back to the good Photo-Finish cow family that we hang our hat on! His full sister was Grand Champion Heifer Calf at the National Speckle Park Show at Canadian Western Agribition and Reserve Champion Female over all. Leptin Tested: CT Consigned By: Notta ranch & Kager Ent. The dam of Dare 302D has a ton of milk power and is backed with Zapper, the National Champion Speckle Park Bull in 2013. The cool colour and depth of this bull will be sure to impress. Leptin Tested: CC Consigned By: Notta Ranch & Kager Ent. Ravenworth Kleos 3Y Ravenworth Kleos 3Y was Junior Champion 2012 and Senior Champion Speckle Park 2013 Bull at Agribiton. Kleos has produced some strong females with one of his daughters being the Junior Champion Speckle Park (2014) Female and First Lady Classic Speckle Park Breed Class Champion (2014) at Agribition. Our River Hill 12X Zaar 7Z bull was the sire of the Grand Champion Speckle Park Female (2015) at Agribition, Ravenworth Western Jewel 116B, owned by Colgan’s Cattle Co. Zaar 7Z has produced many females and bulls of the type and style that we appreciate. Including being the sire of many of our high selling heifers. terms & conditi0ns... TERMS: The terms of the sale are cash or cheque, payable at par at the sale location. The right of property shall not pass until after settlement has been made; no invoicing on buyers in attendance unless previous arrangements have been made. Every animal sells to the highest bidder and in cases of disputes, the auctioneer’s decision will be final. Announcements from the auction block will take precedence over the printed matter in the catalogue. Current exchange rates will be announced sale day. All monies are in Canadian funds. CERTIFICATE OF REGISTRATIONS: Each purebred animal will carry papers issued by the Canadian Speckle Park Association. A certificate of registry duly transferred will be furnished to the buyer for each animal after payment has been made. HEALTH: All animals in the sale have met all necessary health requirements. GUARANTEE: All sellers and buyers of Speckle Park cattle in this sale are expected to be knowledgeable of and to abide by the Guidelines for Seller and Buyer Expectations and the By-laws of the Canadian Speckle Park Association. These documents are available from the Association’s office. PREGNANCY INFORMATION: All serviceable age females have been pregnancy examined by an accredited veterinarian, giving an estimated length of gestation. This estimated gestation period shall be used only as a guideline to calving and is not a guarantee of actual service. LIABILITIES: All persons attend the sale at their own risk. 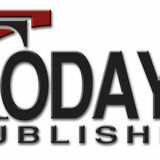 The seller, facility owner and sale manager assume no liability legal or otherwise, for any accidents that occur. It is understood that T Bar C Cattle Co. Ltd. is acting only as a medium between buyer and seller and is not responsible for any failure on the part of either party to live up to his obligations. Neither does T Bar C Cattle Co. Ltd. assume any financial obligations to collect or enforce collectionof any monies between parties and any legal action that may in exceptional cases be taken must be between the buyer and the seller. T Bar C Cattle Co. Ltd. assumes no responsibility for any credit extended by the seller to the buyer. The buyer must look to the seller for fulfillment of all guarantees and representations made hereunder. DELIVERY: Every assistance will be given in getting your purchases home. Each animal becomes the risk of the purchaser as soon as sold. PHONE, MAIL, WIRE BIDS: Bidders unable to attend the sale may phone, wire or mail their bids and instructions to the sale manager, auctioneer or special representatives. Bids must be received in sufficient time prior to the sale. INSURANCE: We strongly recommend that insurance is purchased for full value. ERRORS: All announcements at sale time, written or oral, supersede any written material in the catalogue.